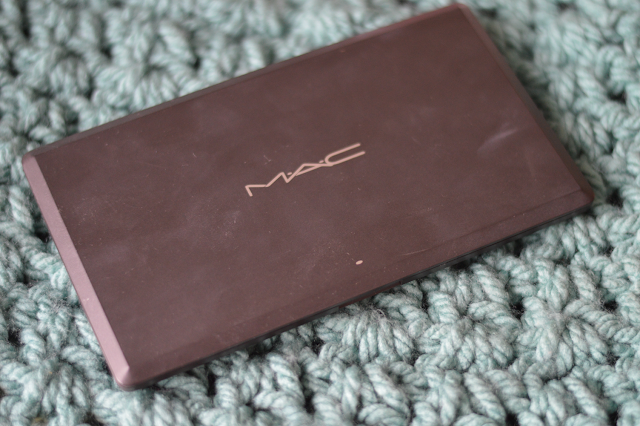 I finally made the decision to pick up the Mac Pro Palette Eye Shadow Quad, after reading Vivianna Does Makeup. I have the 15 pan palette and to be honest it was bought with the pretence that I would fill it but I only got to fill 9 spaces. Whilst the 15 pan palette is slim line it's still a generous size, I actually found I wasn't reaching for it and found it a chore to have to sieve through my drawer to find it. Where as now I know the shadows will get used, thanks to their new minimalistic home. So after some careful consideration I picked my worthy four shades and slotted them in with ease and pleasure! I love how you can see the shades through the clear lid, something you can't from the old 15 pan palette. I'm no makeup artist so I'm not sure what made me buy it in the first place, but all I know is I'm a happy bunny with my quad. 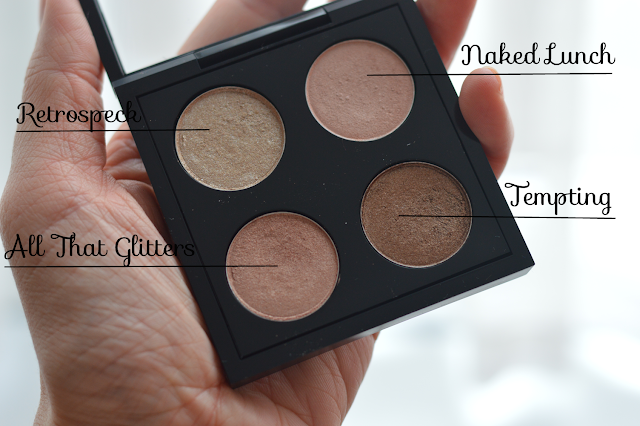 I went for a neutrals palette, easy to wear and great to carry in your makeup bag. This is the kind of palette I would take on holiday with me. 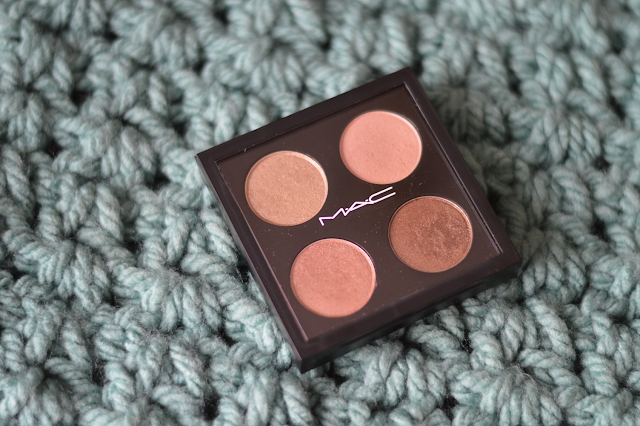 It has the perfect balance of satin and shimmery shades. Retrospeck is a lustre finish and described as a beached blonde, I would say it's a soft gold with silver flecks. A very pretty highlighter or corner shadow. Naked Lunch is a frost and described as a minimal pink with shimmer, I would agree 100%. It's a lovely soft pink champagne with a subtle shimmer. A great all lover lid colour. All That Glitters is a veluxe pearl and described as a beige with gold pearl, again I would agree it's a beige with warm tones to it. Tempting is a lustre finish and described as a sinfully rich coco, it's one of those shades which transforms a natural look to a smokey look. I picked this one exactly for that reason, it blends easily and works well with the other shades in the palette. 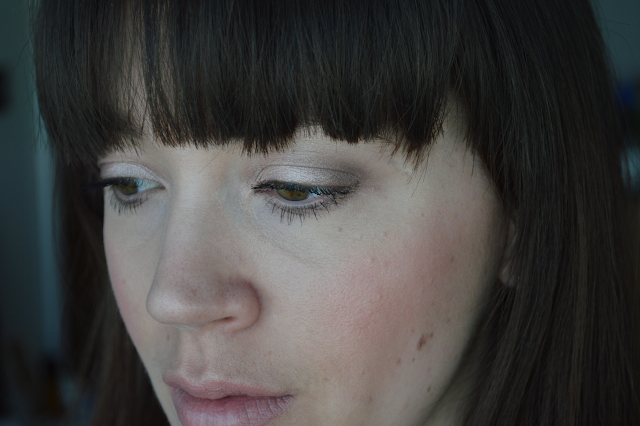 I used Naked Lunch over the lid & Tempting blended into the outer v & along lower lashes. Then Retrospeck on brow bone. My next investment will be the duo palette, I want to use it as a brow palette. 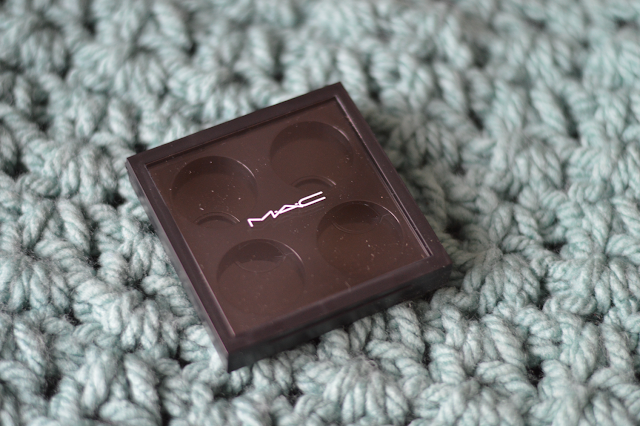 I have one matte brown shadow which I use as a brow filler but I would like to pick up another matt brown. So if you use a MAC shadow to shade your brows please let me know. 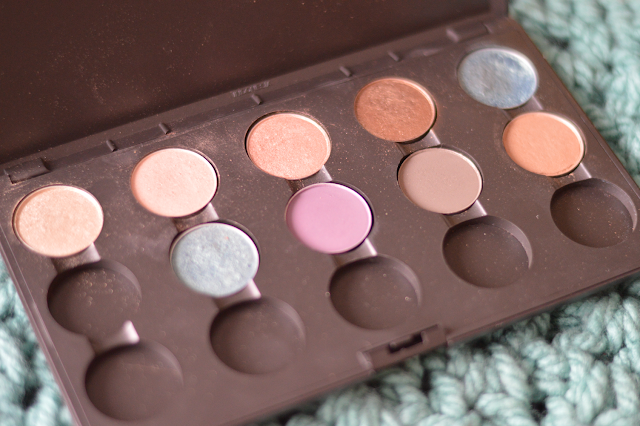 I really need to pick up a quad palette, naked lunch looks gorgeous! I think I need to do this with my MAC palette as well. I too find I often neglect it because it just seems so bulky and cumbersome to use. BTW your blog is so lovely! I'm a happy new follower!